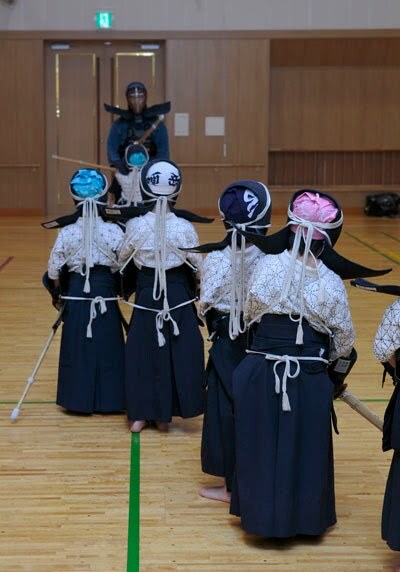 One of the benefits of writing this blog is that I get feedback from kendoka in other dojo and other countries about the way they do things and the challenges they face. This often stimulates ideas which I use when physically teaching kendo. Thomas Sluyter’s comments on kirikaeshi following my last post helped me refine the drills for our group at Sanshukan. One thing that is becoming obvious as we go through these sessions is that the theory is relatively easy to explain, but that it takes constant practice to develop motodachi skills. Hikitategeiko in particular is an area where experience is essential. No matter how well you understand the theory, unless you are able to read your opponent and build and relax the tension between you, it is unlikely that you will reach the desired outcome. Just to reiterate, hikitategeiko is jigeiko between a senior and junior partner. Motodachi uses the opportunity to practise his own technique whilst encouraging kakarite to do his best. It works if the more experience player sets the standard reasonably close to the junior’s level, so that he acts as if he has only half a dan grade advantage. By this I do not mean that his technical kendo standard should be lowered, more that the competitive advantage is narrowed. At the beginning of every keiko you should treat each opponent with the same level of respect. I therefore think that it is your duty to face him earnestly and to try for shodachi or the first point. You may be surprised that the junior player is the first to achieve this. No matter who takes the first ippon, this is a chance to study your opponent; how he moves and his strengths and weaknesses. You should continue to make your own opportunities using seme to penetrate his centre and maintain kizeme (mental pressure) to put him at a disadvantage. When however he makes a strong attack you should allow it to connect. This is the ideal opportunity to practise your oji waza, so use hiki dasu to invite his strikes and then respond with suriage or kaeshi techniques. Do not however break his spirit by countering every attack. It goes without saying that you should not block, physically stop him with the point of your shinai, or resort to miss timed or sneaky waza to make a point. Depending on kakarite’s level there will come a point in the keiko when the tension between you breaks down. This is normally because his level of concentration and focus is starting to diminish. By now you should have evaluated any bad habits or mistakes, so make the transition to uchikomigeiko; making opportunities for him to strike. Do this in a way where you use pressure to control distance and opportunity so that he strikes with correct timing and maai. Use this chance to make him correct any errors. You may have to demonstrate how to do the technique yourself, but do so quickly and keep conversation to a minimum. If it requires a long debate, have it in the pub after training. If kakarite is relatively skilled, then perhaps uchikomigeiko should be reduced to just one or two techniques at the end of the keiko. It may even be that you finish with ippon shobu, but if kakarite is that strong, we are moving into the realm of gokakugeiko. Giddy with the mention, I’m glad that my questions led to an interesting chain of thought.